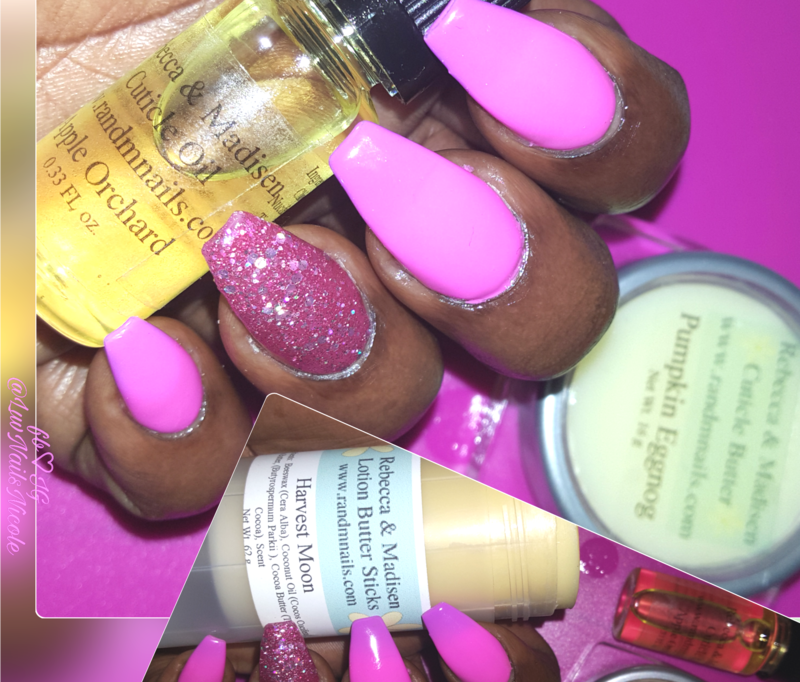 I received these Nail Care Products from RebeccaAndMadisen to try&share my review on what I think of the all 4 products. 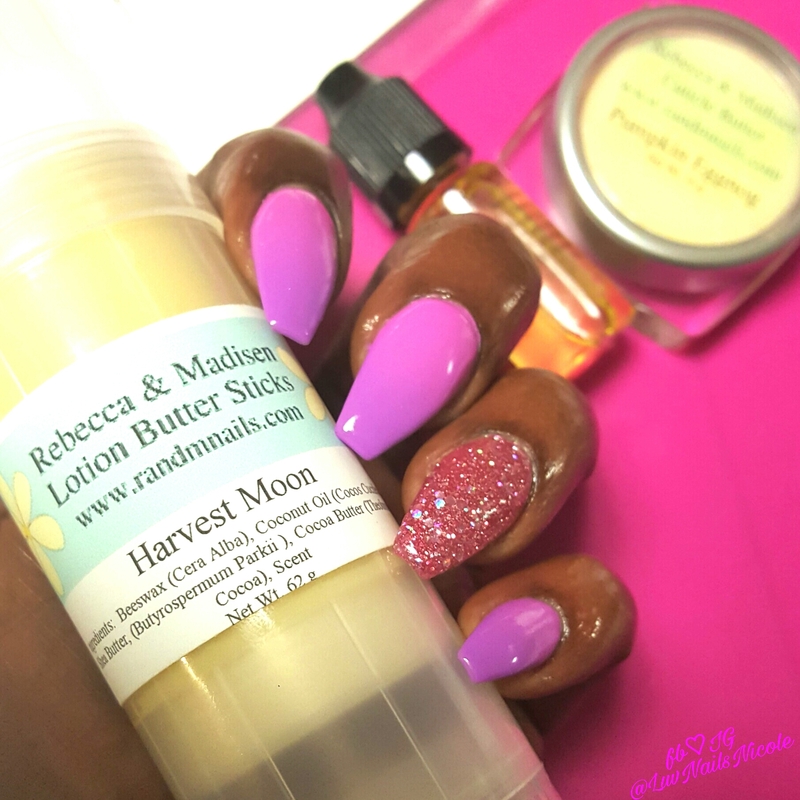 RandMnails is a Mother Daughter Duo that makes their products hand mixed with natural oils. They Recommend Applying the nail care products at least every Hour to bare natural nails for 2-3days and avoid having your hands in an excessive amount of water. If your hands are in water alot then wearing NailPolish or a Clear Topcoat is ok since it will help keep the oils from being washed off. I’m hardly without polish on my nails so that’s how I use mine but I did go naked for the 1st 3days.No Acrylic Nails&No Polish so I can get the full results. All the lids are Child Proof just push down&twist.This is also a really good way to help keep the lids on while in your purse,traveling case etc. 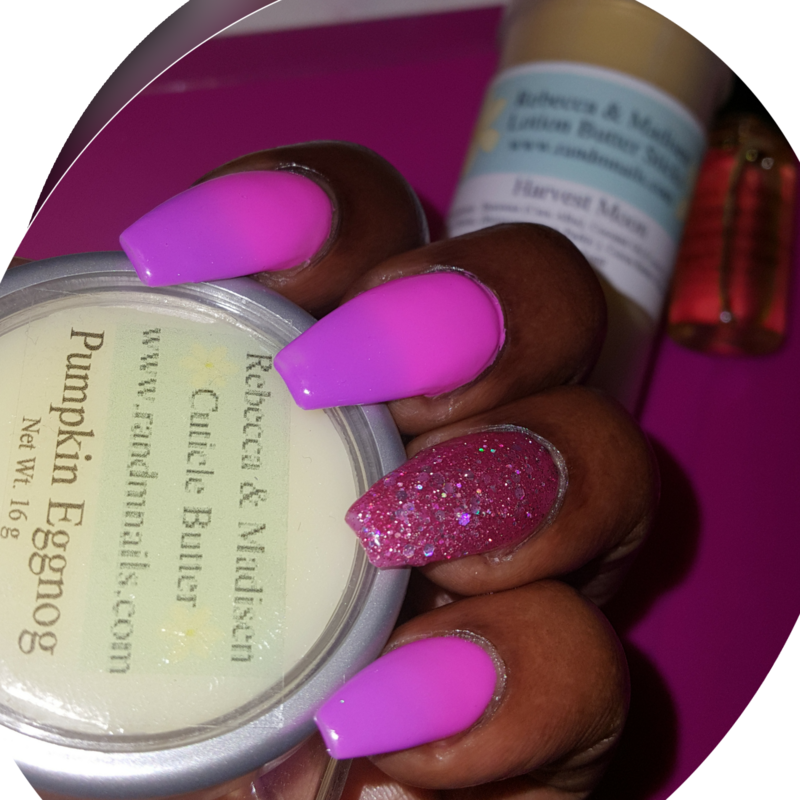 1st up is the Cuticle Butter in Pumpkin Eggnog Scent.I luvvv this scent! It Came in a round container with a Twist off lid. I usually just take the lid off&rub it across my Cutes(cuticles) Or Dab my finger in it then rub it on.Its really soft,not hard or flaky like I thought it would be.Very easy to use&apply.Its Butter Soft actually Lol! It kept my cutes&fingers soft even After it dried.Some oils I have used,after applying it looks like I didn’t put on any oil once it dries So i was happy with how long it kept my Cuticles Moisturized. I have a huge problem with the skin on the sides of my fingers always being dry&cracking along with my cuticles.Plus my Natural Nails are thin,peel& are brittle.The Oil and Butter Helps with that specific problem. The Maker Of the Product Rebecca had problems with her Nails Peeling due to excessive use of hand sanitizer&washing them at work constantly. Thats why She decided to make the Cuticle Oils &she also wanted a good quality oil that will actually help stop the peeling. So far all the Nail care treatments have helped resolve that issue for me in about 3weeks of using multiple times a day. My Nails do have a lil ways to go but I’m seeing a huge improvement on my Cuticles Not Cracking,My Nails aren’t peeling& my skin around the cuticle area isn’t super dry. The Cuticle Oil in Apple Orchard Scent works just the same as the Cuticle Butter.They Both Smell so good&its not overbearing. The Scent last awhile.Apparently I was sniffing my fingers so much my hubby noticed & said I look like the girl from the Movie Superstar!haha! I couldn’t help it,I luv a good Smelling Cuticle Oil! Next is a Lotion Butter Stick in Harvest Moon. This was the first product i tried.I was so excited about this stick of Lotion!I dont know why,I guess because its Unique&Something I’ve never seen. It reminds me of those Push-Pops or PushUp Popsicles. To use the Lotion Stick You twist at the bottom to turn the Lotion up as far as you want it.I was surprised at how good it moisturizes to being that it’s a hard form of Lotion.Its soft like the cuticle Butter.I rub it on my hands after a manicure,on my face after a facial & anytime my hands feel dry.Perfect for after washing dishes or washing your hands to.Lately I have been keeping it in my purse so I can use it on the go. Last is a Lip Butter in Razmonade It smells as good as it sounds.Its almost gone I use it all throughout the day and after i use my Lip Exfoliator. The Balm is Perfect for this cold snowy weather I’m in that makes my lips dry&crack. These are all for sure products I will keep using in my nail care routine &I definitely recommend trying them. 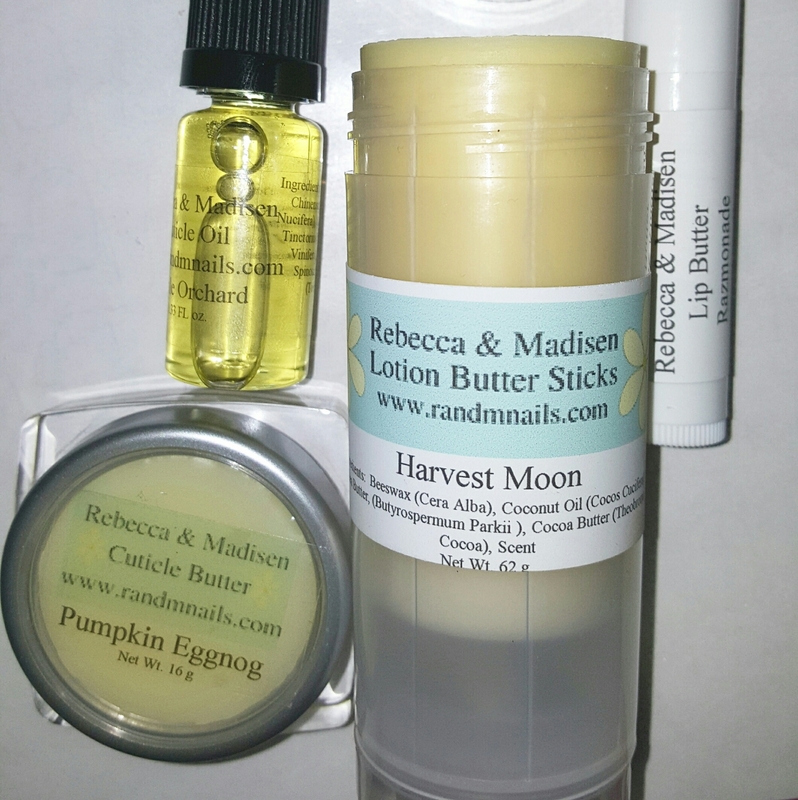 Especially because all of RebeccaAndMadisen Products are affordable compared to some Indie Brand oils&lotions.